Oh it’s been a while! Mama got sucked into the vortex of college and couldn’t get out!!! I’m back, and it’s time for a River Spectacular!!! River is doing fabulous first off! We had our 3-month check up with her GI clinic and she did gain weight, but sneaked down the scale a little bit, now coming in at 7% BMI. But Dr. was assuring and said that this is River’s trend and she still falls within her general curve and not to be worried. 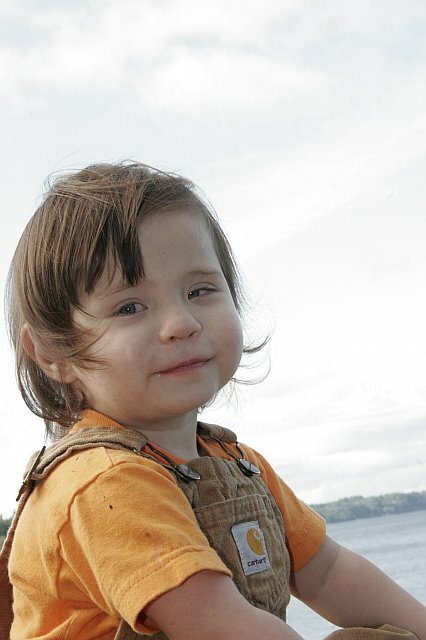 He changed out her AMT Mini G-tube button, and River cooperated so amazingly I was wondering who this little girl was. 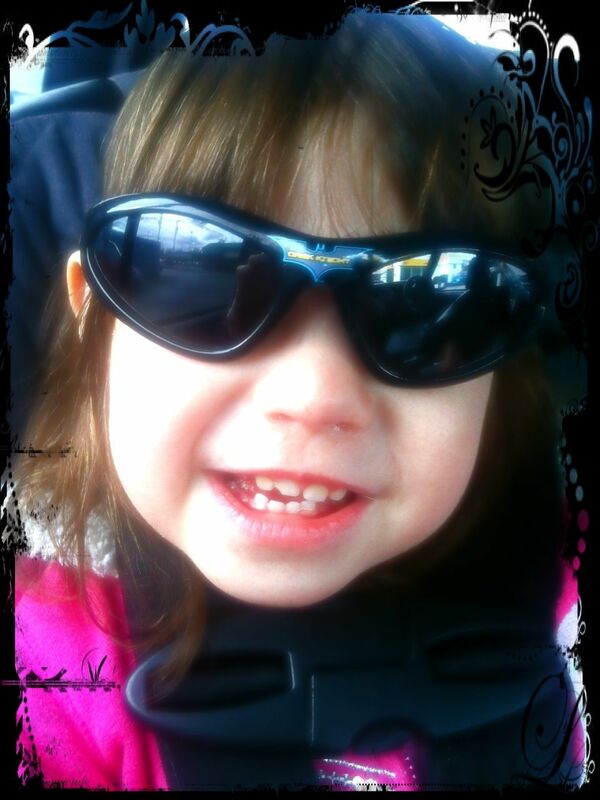 My little girl…not my little baby, anymore. She’s grown up so much this year! She would have normally pitched a huge fit and freak-out session, which is why we switched to changing out her tube usually while she slept. This new AMT is a bit trickier to get in, and I doubt she’d sleep through it like she would the Mic-key. She was uncomfortable, scared, but so brave, and she surprised me! We got the big news too, that if we can manage not to touch her tube for the next 3 months(by that I mean use it for supplementing her) that we may be able to get it out in the fall! This is exciting and scary. So far I haven’t touched that since last week, but I keep wanting to feed her extra! That 7% is bugging me, she was over 10% three months prior. We will just keep taking it day by day as usual. Assessing the situations as they arise. 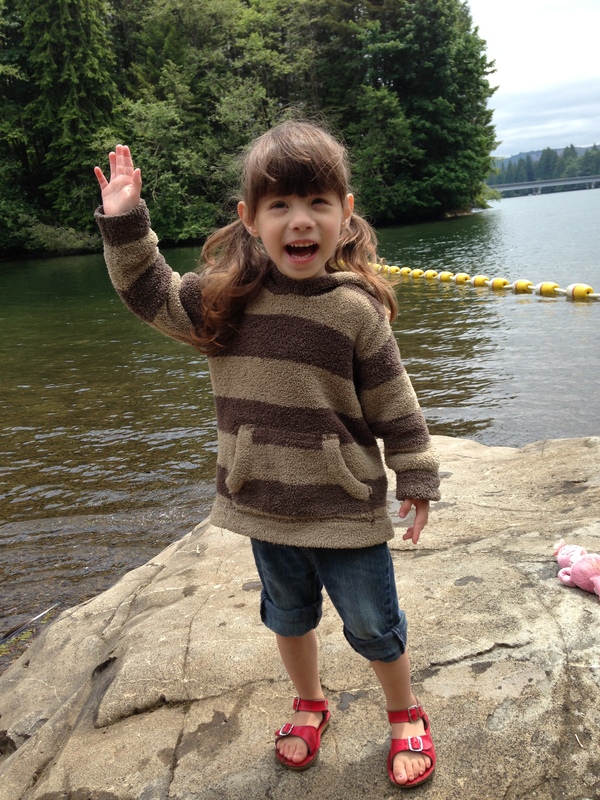 In other related news, River recently got assessed in the local Childfind, and she has been approved for preschool starting in the fall, where she will receive speech therapy as well as regular pre-schooling. She has been seeing Julie, her SLP, weekly since about March. Her speech patterns are similar to Ewan’s early errors, but she has caught on that we want her to add sounds, also to improve her volume and clarity. It’s been going really well, but I think it will take time for her to start integrating these improvements in her regular speech. She does excellent during therapy, and daily reminding, but usually doesn’t translate over to her talking. But I predict speech therapy will do it’s job to help her and by the time she hits kindergarten she won’t even need it! 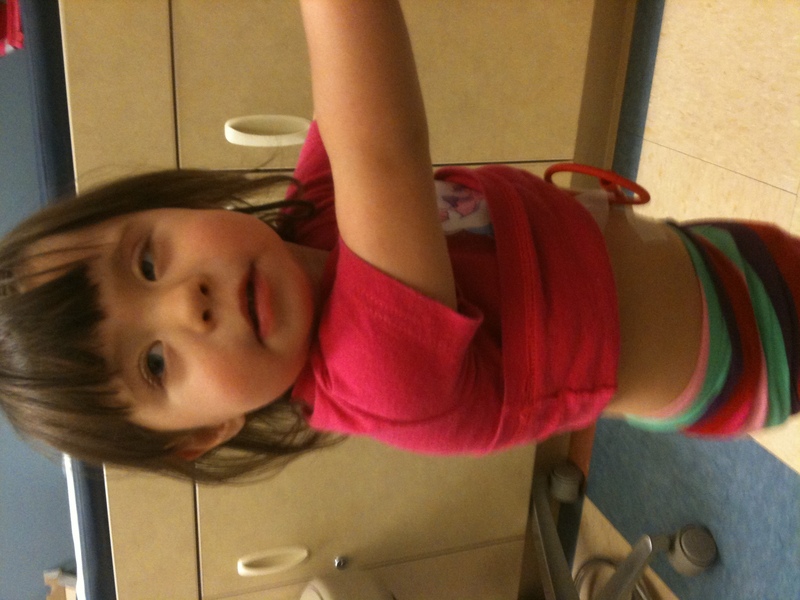 Ms. River is a head strong determined little girl who knows what she’s doing….maybe she is ready to let go of the tubie. Am I? Summer 2013! Yay it’s here!! We’ve recently been trying to accomplish a “no night feed” lifestyle. It’s had it’s ups and downs. And having River’s molars all coming in at the same time added with a cold hasn’t helped this along very well. Hopefully when these teeth pop out and her cold symptoms dissipate we will have more success. Once this week we had a no night feed!! Yay for progress! So for one feeding a day we put her on her pump, this has worked out pretty well. Except for the frightening experience the first day her nanny got to use the pump! River’s current mic-key button was about 2 months 1 week old, and they get changed every 3 months. So the balloon was a little low on water, and we think (according to the eye witness statement of a 3 year old) that River, while getting her pump feed (currently her Joey pump, that we sit near by with slack running to her) slid herself off the couch and managed to pull the entire mic-key out!! I was in school and got the distressed text from Patty! We of course had spares at home, so I had to get daddy to rush home, and try and assist in placing a new tube. I was 40 minutes away, and by the time both daddy and nanny tried to insert a new one(both rookies) it had been around an hour. Unfortunately their efforts were in vain! They couldn’t get one in. I left school and called the GI clinic, who thankfully said come in and they would take care of this. We arrived at the GI clinic, now nearly 2 hours out, and I guess the problem that had occurred was a narrowing of the stoma. She get’s a 14Fr (size 14 French, or gauge). The nurse starts with a 12Fr size tube and sees if that will go in. She said they need to get that stoma to dilate again. Fortunately the 12Fr goes in. They tape that to River’s tummy, then let it sit for 20 minutes. River also puts up quite a fight during each of these insertions. But can you blame her?!? After that one she places the 14Fr tube, and lets that sit for 20 minutes before trying a new mic-key button. Thankfully, everything went smoothly and she got the mic-key in. But Dr. P wanted to be cautious, and get an x-ray. And X-Ray is right down the hall, thank god! That was also not fun for River, but better to be safe! Everything is cool! After a 2 hour visit to the GI clinic I finally get to take my exhausted, very thirsty, and hungry girl home! She dumped a water bottle all over herself in the car, and then passed out! Poor baby! She stayed asleep for a little while and I snuck in some food. In other news, she has recently been evaluated by Occupational Therapy and they, and I, think she will benefit from some Vestibular Sensory therapy. River is a cautious baby, and we think the reason she isn’t walking (because she is nearly physically capable) is that she’s too scared of sudden movements, and that fear of falling. Hopefully several OT sessions will give her some desensitization of these and get her on her way to walking. I’ve also spoken with her GI clinic and infusion providers, and we are going to switch pumps, to the Infinity pump, which is way smaller and we hope to get are used to wearing it as a backpack. She has also had several very good feeding therapy sessions lately. We start out with bubble play, and that warms her up to textures and sensations on her hands. We’ve had good eating during the last few times visiting Jennifer. And miraculously she had a great PT session with Jean last week where she was fully cooperative and happy and did most things that were asked of her. Even though her vomiting has increased, her sleep is disturbed and she has this upper respiratory junk, she still constantly amazes us! I’m looking forward to Thanksgiving and having her sit with us and hopefully try all the yummy foods!!! But I don’t wait for that day to be grateful. I have way to much to be grateful for so I make sure and make everyday filled with thanks. So a week ago we returned from our first camping trip with River. I was totally apprehensive at first, but having just taken her on a month long trip away from home I felt that maybe I could handle the feeding needs of a tubie out in the forest. 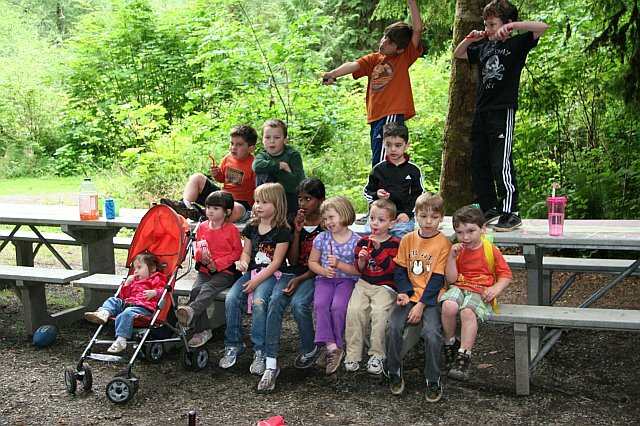 It was our annual “Momzilla” camping trip where I and fellow mom’s take our kids out to a local campground, sans manly assistance. 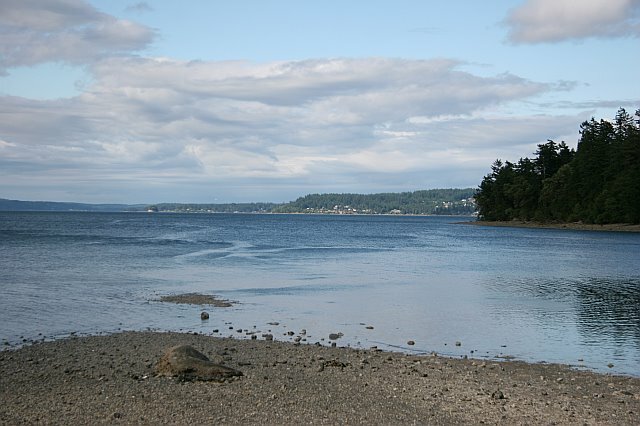 We went to Penrose State Park on the Key Pennisula in Washington. An easy 45 minute drive. Of course all the packing and food planning and unpacking and setting up was all up to me. Overall I think the camping experience went great for the us, even though I was a little stressed. We stayed two nights at a great group site where us moms and kids had a huge site to ourselves. Now as for dealing with tube feedings: I give it a one out of two thumbs up. 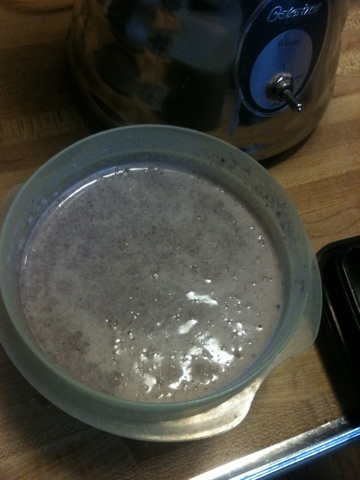 I was able to pre-make enough blenderized food, plus bring along water and milk and powdered formula. The Joey pump’s battery was easily capable of handling two nights without being plugged in, and her night feeds went exactly as they always do. I blended up and froze most of her food. I only had one small cooler, this was one of my cons. I wish I had of bought a nice big cooler and gotten more ice. I believe her food stayed plenty cold up until day 2. I would chase her down in the dirt, and pop in a bolus feed and tried to stay on our normal schedule. On the second day River, a very very dirty River, threw up like 3 times! Each vomit might have been contributed to her crying or other factors. But after the 3rd vomit, I threw out the blended food and went with the little bit of squeezy store-bought baby food I brought as back up. The dirt I had to deal with was the most stressful. I have a scooter baby, who scoots around in dirt if dirt is all there is! She fortunately has gotten past putting twigs and rocks in her mouth, but still dirt is so fun to play in. 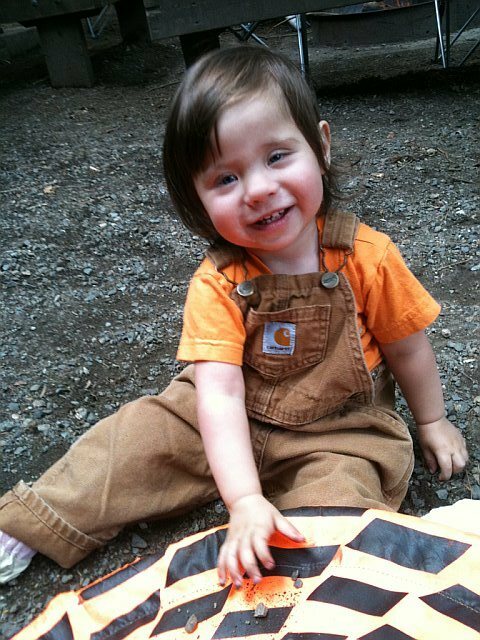 I kept her mostly in big durable overalls and “crap” clothes. No sense in being “cute” when you are just ruining everything on your body, baby! The other thing I found the most difficult was just the feeling of not having a sanitary place to do tube feedings and get out the syringes and stuff. I just had to grit my teeth and push through the perceived problems dirt was causing us. Her vomiting day was suspicious though, was it because of the crying fits, or was it the food? Who knows! Either way she LOVED playing in the outdoors all day long. Naps were out of the question, but she slept good at night for the most part, even if I didn’t. And next time, either this year or next, a deluxe cooler of some sort, and a “clean” prep station for Michelle and River. Other than that, I would say camping is totally doable in the world of tubies. Get your kids outdoors and dirty people! They love it! So Doable may not be the word most tubie parents would take as inspiring, but non-the-less it is, doable. It is not ideal. Ideal would be if I had a 5-star camper or 5-wheel, or giant RV bus. But that is not what we have. I did borrow a very large tent mind you, I didn’t want us to be squeezed into a tiny 2 man. And my fellow mommies are always very helpful with River and our needs. And when River is bigger and walking and less scooter-dirty, it won’t be quite as bad! Camping will only get easier and easier with her. I just had to grind through this one summer with a baby/toddler. And I also skipped out on camping last year since she was only months old, and camping +heart failure = completely out of the question(for me anyway). But I’m a camper, I love it, and I will have my kids raised on it! 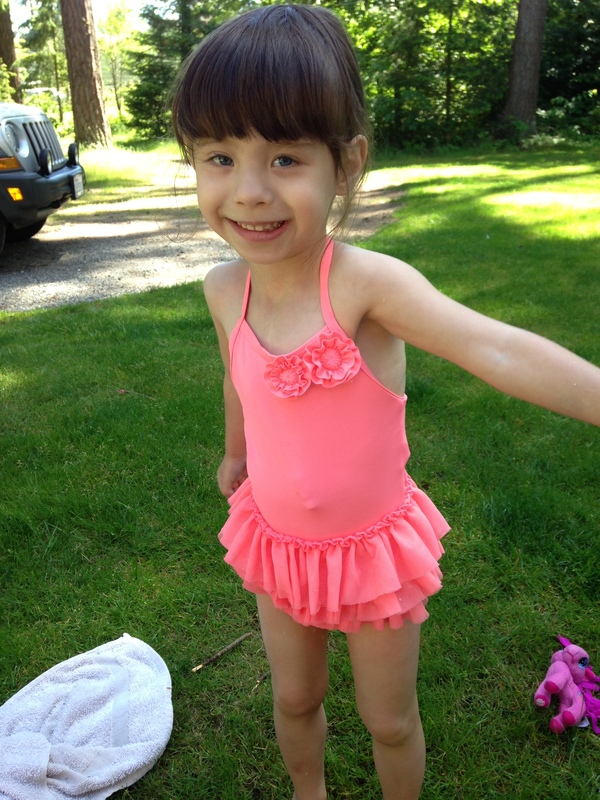 Swim time, and with a tubie it's no problem! We are in week 2 of our month long vacation down in Utah. I’ve been a little silent on the blog front because of that. We are taking a nice, long, sunny vacation down in my home state with our family and friends. Both River and Ewan have been doing great and we are all taking a little break from therapies and appointments, and the rain and the clouds in Washington! We flew out this time, same as back in February. Thankfully I had Daddy with us on the way down, taking River on a plane was a bit challenging this time since she has begun to express her little feisty personality more, and was behaving a bit more like a bored toddler on a plane this time! Sadly, though, Pete couldn’t stay for the whole month, unlike his stay-at-home-wife can. River has been doing about the same with her eating skills. She is still adventurous and wants to try anything we are eating. She is still very limited though in what she can manage to chew and swallow and not throw up. 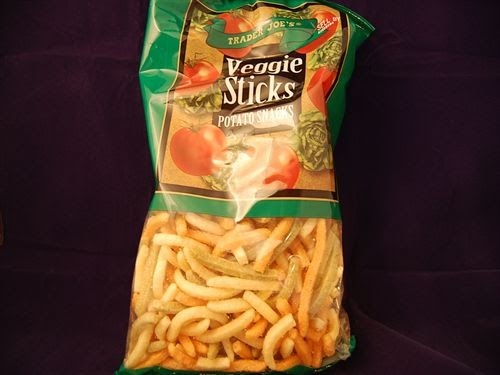 Our veggie sticks are having the most success lately, they melt easily in her mouth and are pleasantly salty and crunchy. The other highly successful food lately with her is cream of brocolli soup!!! We keep it stocked in the fridge now, and if we go out to eat that’s usually what I get so she can have a few bites. We have also found a sippy cup that’s working pretty well, an easy grocery store buy, a munchin no-spill cup. There is no way around it, traveling with a tubie is not easy!! It takes a lot of extra packing and planning and everyone being on board with what’s best for your tubie’s needs. It’s been a bit of a challenge not having my Oster blender I use at home. It does a fairly good job, rarely I may need to strain my blend just to be sure it will pass through her tube. So far at my MIL’s and mother’s houses I’ve been using their cuisinarts, with acceptable(not fabulous) results. Still have to strain a lot! But we make do with what we have. I’ve shopped at several stores and gotten the foods River is familiar with. But we are on the go a lot! I’ve had to find a quick way to pack up some food for her and get out the door so we can go enjoy ourselves at different events. And it all fits inside! 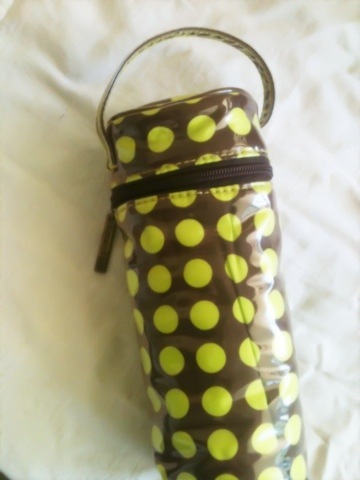 Not only useful, but cute, I have seen these bottle insulation packs around, and I stumbled upon one at a consignment store for $1.50 the other day and I thought it might be useful. It’s my new favorite thing! 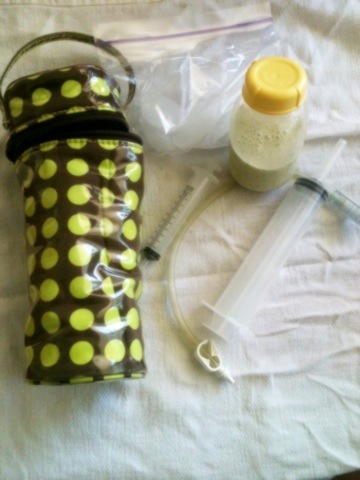 I just put ice in the bottom, the blended food on the ice, shove her syringe and tube inside, zip it up, and off we go! I think it’s good for about 2-3 hours at this point, unless I can come up with a way to keep the food even colder inside. With all the back and forth and messed up schedules, I’ve gone to just feeding her about 2 oz of BD every 2 hours. Its a bit too much for my brain to attempt a different schedule right now, but I’ve finally had some time today to sit down and start working out a better feeding schedule and better recipes. I am trying to see if we can’t feed her less formula at night, and get more down her during the day. We’ve stopped the 6 a.m. formula feed since being down here and I can already tell she’s hungrier in the morning, so I want to keep it that way! I’ve also read that some kids do good with giving water a while before each feed might aid in better digestion and less vomiting. I’m going to see if I can work that into our schedule too! My other upcoming feat will be in perfecting River’s daily feeding and fluids into something manageable for her Nanny to do when the time comes in September! Our amazing Gramma Patty(it’s one of my friend’s moms, whom I’ve adopted as my Washington mom) will begin watching River along with two of her grandsons starting in September for us, because Mama(me) is going back to school! Yesterday I got some of the best news that a mom can get! I found out that I’m doing a pretty damn good job at feeding my kid! I swear, even with Ewan, nothing satisfies my maternal instincts like knowing my children are eating and growing well. After a three month gap, we got to visit with Dr. Pickens, gastroenterologist. 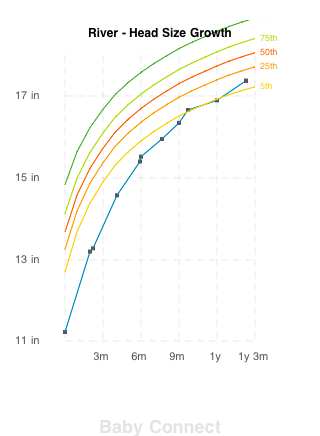 River’s check up with GI clinic was a very good dose of much anticipated growth charts after just starting blenderized diet several months ago. Her stats are as follows: Weight – 9.62kg, or 21 lbs 3 oz, Height – .762 m, or 2′ 6″, and Head size – 44.3 cm, or 17.44″. That equates to weight 30th percentile, height 50th percentile, head 11th percentile. These are ALL HUGE IMPROVEMENTS! 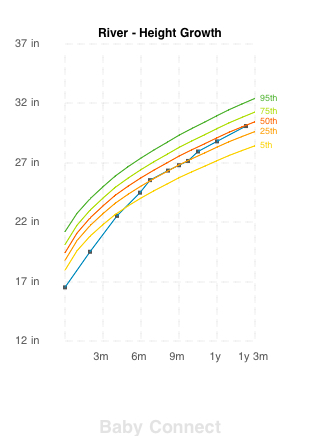 And that’s not even the adjusted premature infant chart scale! That’s percentiles for babies her age! There is a remarkable leap up the charts since her last visits. Everyone directly believes that her diet is the reason why. Yay!!! I feel awesome that I’m feeding her good! I felt like I had some good information from helpful social networking, but I felt like I was also winging it. Hooray for Blenderized Diet!!! We can also start moving away slowly from formula. We can start to go half and half with some whole milk, or soy or hemp milk. Depends on what she tolerates. I still suspect a diary intolerance. And we constructed a plan to do a shorter night time feed. Hopefully get up a few less times in the middle of the night! Here are her charts. These things are usually only of interest to parents! The rest of you will get bored. Fun right? I’m so thrilled! Dr. Pickens was very pleased, even though River was not happy to see him! First time she’s ever burst into tears as a doctor walked in the door. It took a long time to calm her down. And we also had him change out her mic-key button while we were there. It was past due, and I waited until this appointment to do it, because River really fights us these days whenever we clean it or put medicine on it! She actually held still. In tears and fear!!! It was sad, but quick and dirty. She even went down a size on her mic-key. We are seeing if a tighter fit will help to control the granulation tissue. She is now in a 1.2cm 14fr size mic-key. Technical stuff. We also visited with a dietcian. Phuong, who was our dietician in the ICN, was actually the one who came it! It was fun to see an familiar face, and she recognized us, but certainly not River who has grown up so much since she was there last year. River might not be eating much by mouth, but at least we can still keep her thriving and happy. It is yet another journey to get rid of this g-tube!! Sometimes it feels like tube feeding is always going to be a part of River’s life, and ours. It feels as though she will never learn how to eat, not as long as she’s being fed. Lately her oral progress has come to a stand still, maybe even reverted a little. Her recent cold/teething symptoms that always make her full of congestion and increase her vomiting has definitely taken it’s toll on her oral progress. She willingly takes food to sample and try to eat, but almost every time now it results in a gigantic vomit. It’s at least positive that she will try food, I know of many other aversion kids that won’t even try things. I just feel so bad for my baby when she retches everything up when she so willingly wants to attempt to eat it. We continue with her blended diet these days. Her day is half formula and half blended foods. Mainly the blends consist of apples, carrots, pears, berries, rice milk or yogurt or kefir, flax or olive oil, some formula powder, almond butter or avocados, and a protein such as lentils or a little bit of scrambled egg. It’s usually not all of those things in one blend, but those ingredients are what she mainly consumes. I feel it’s going really well, even though it’s a bit tricky to syringe feed her up to 8 times a day. It seems that her tummy, when empty, can hold up to 3 oz without rejection. We call them her baby smoothies, and Ewan often wants me to make him one too. I ate about 5 blueberries! Two new foods that have made it down her with some success lately are frozen blueberries (I figured since Ewan eats these like candy maybe she would) and corn puff treats, they are cheese flavored. I think of them as edible styrofoam, but for some reason they are a hit with her, they melt easily in her mouth and she doesn’t seem to gag on them very much. We are preparing ourselves for a large vacation coming up! River and Ewan will get a huge break from therapies, and so will I, in the month of June! We are going to our home state of Utah to stay with all of our various family members. It’ll be a much needed dose of sunshine. Ewan will be finishing up his last year in preschool and then we will jet down south! I can’t wait to show off my large baby girl to everyone (there have been so many changes since they last saw her just 4 months ago)! I get to take Ewan to a place that I grew up going to: Lagoon! I am so use to visiting Utah in the winter months, that I am actually thrilled finally to be going in the summer. It’s going to turn into our new tradition. We will visit for a whole month during summer when the kids are not in school. My children will get some much needed quantity time with their loving grandparents, uncle Dan, and all of our friends! Just a few short weeks and we will be down there. Again, as much as therapy is vital to my children and we appreciate the need for the hard work that it takes to get my kids on track, it’s also nice to be able to take a break! Especially from this northwest gloom!!! Utah, here we come! I know the day will come around when we will get to throw out all the medical supplies and say good by to the g-tube. But it seems so far away!!! For now we must walk the path of this lifestyle and keep hoping for the best, for what else is there but what we have today? Today is a present as they say, and I still view everyday I have with my babies as such, even if it’s unique and differently lived than most others. I’ve been holding back until now to talk about the new formula that we’ve started for River. It’s been a completely amazing discovery for us. But first I have to go back a little bit to explain. River began throwing up a lot when she was about 3 months old. The doctor’s only explanation was “reflux”. She was diagnosed with GERD. They put her on a PPI (Prevacid) and we began trying new formulas. At the time she was on breastmilk mixed with Neosure formula. Slowly over time my breastmilk supply decreased, and we had to go up on using formula. Her throwing up also got worse. It also caused her oral aversion. 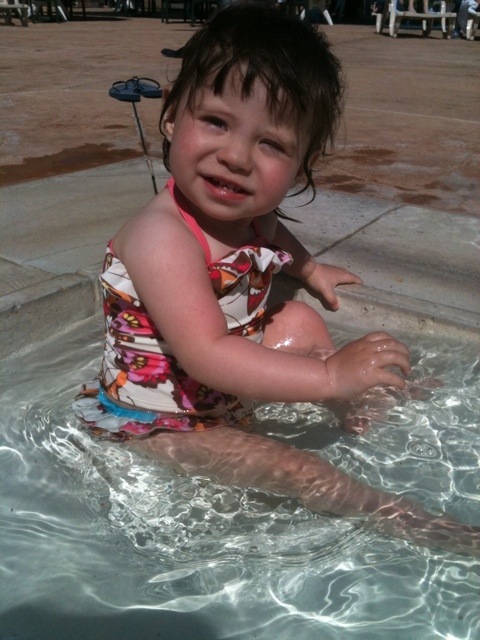 After her heart surgery in August, we finally got a long awaited GI consult. He recommended the most hypoallergenic formula, Elecare. They also wanted breastmilk completely removed from her diet, as maybe something in my milk was the culprit for her intolerance. Was it reflux or intolerance? Dr. Pickens has always referred to it as River’s Puzzle. We tried ruling out various things, like they gave her a gastric emptying study (nuclear medicine, horrible horrible test where they fed her radioactive formula and strapped her to a board for an hour). The study came back normal. They gave her a reflux frequency test, which required a tube placed down her nostril, just like the NG tube, which measured how many reflux events occured in a 24 hour period. This test came back without exciting results. She refluxed about 7 times in that 24 hour period, and they were non-acidic which indicated the Prevacid was working. That concluded their tests, and the rest was whatever other pieces of the puzzle that I brought to them. Her vomiting continued, it got a little better, but still a daily event. And multiple times a day if something made her retch, like oral stimulation. I put my trust in these medical professionals, and I trusted that this was the best formula for her, until recently. Still she was throwing up at least once a day, and ever since getting her g-tube placed was having lots of gas in her tummy, and that would make her throw up too. I went on the hunt for another formula. Our GI doctor and nutritionist gave us Neocate to try as it was the only other formula they had in their case of magic formulas. That turned out even worse. So back to the Elecare. Elecare has also always made her have really runny stools. This always baffled the doc because he said normally it causes constipation. Another little red flag. ALL powdered formulas on the market are made of corn products: corn syrup, corn starch. And lots of it. I wondered if it was that she was reacting too. We, as a family, usually ban all high fructose corn syrup products and the like. There is one formula out there made of rice syrup. I couldn’t wait to try it!!! Within a day or two of trying it, no vomiting. Less gas. Magic had occurred. But after a few days of trying it, she vomited. I was bummed. And then she got a cold, a bad one, while we were in Utah. This made her throw up A LOT! All the mucus, snot, coughing and sneezing would trigger her sensitive gag reflex. We waited this out with hope. After the cold passed, the vomiting got less and less. We have had her on this for almost a month now, and her system has changed. She no longer has phantom vomiting episodes. She might spit up on occasion, but it actually looks like spit up, not ounces and ounces of stomach contents. She burps more like normal. If we have to vent her, there is gas in her tummy, but not a lot. And her stomach contents have begun to look like what one would expect, like digestion is taking place. Also not to mention, due to her improvement and some adverse things I’ve learned about PPI’s(Prevacid) I’ve taken her off this acid-blocker medication. PPI’s can cause problems in bone density and bone growth, and one doctor has recently done a study on it adversely affecting growth in babies. SCARY. Now that it’s been a month I feel free to tell every one that it’s working!! Her poop is even normal!! It’s funny how parents get about poop, but if you are a parent then you know what I mean. Being an advocate for your child is not a luxury. Although not everyone who has a special needs child is out hitting the streets to raise awareness, we all wish we could. But being an advocate for your child is not just about “raising awareness”, it’s a daily battle to keep up on top of your child’s special needs. You have(emphasis HAVE) to keep up on top of your child’s healthcare team and doctors, you have to make sure they are not forgetting about certain details. You have to make sure they are specializing and tailoring their care based on your child’s specific needs. You have to become educated on all your child’s unique medical conditions. You Have To. That to me is being an advocate. Otherwise you might find your child’s conditions worsening, or falling through the cracks of the medical system. I am an advocate for River and Ewan. But I would also like to go outside of just their needs and help speak for the needs of all children of like conditions. I would love to find unique and creative ways of spreading awareness and raising funding for research. But that requires a whole other level of energy and workload. One day I will be able to do more. But in the meantime I will do what I can. 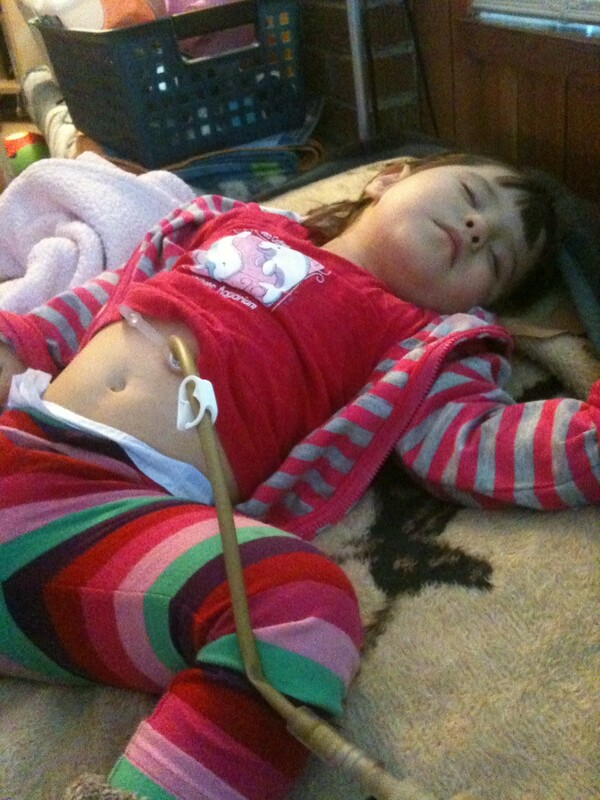 The week of Feb 6 – 12 was determined to be Feeding Tube Awareness week, it overlaps CHD week. 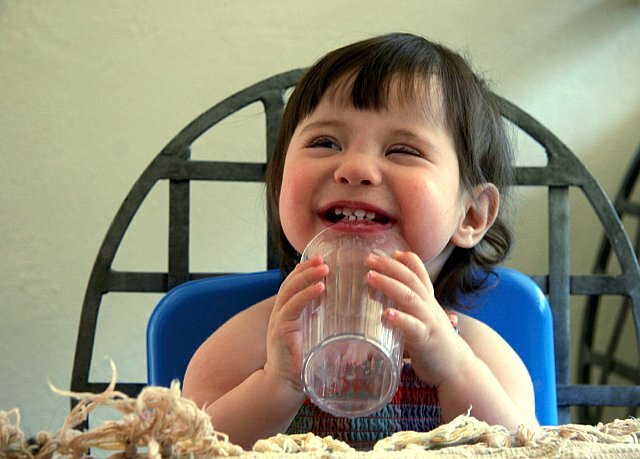 http://www.feedingtubeawareness.com is a new website devoted to our tubie kids, and formed by tubie parents. IT’S AWESOME. I’m so happy this organization has started, I know it will just grow and grow and grow! I wish to participate, but I feel already that I’m being pulled in different directions! Heart or Tube, Heart or Tube??!? I love them both. But I feel that my pull towards CHD Advocacy will overrule my activities.